Facebook made an announcement this week that once again shifts the ever-evolving service. The subscribe button added by the social media service allows you to subscribe to public updates posted by anyone on the site — even if they’re not your Facebook “friend”. This move is being widely reported as making Facebook more like Twitter. I think those who are reporting that are missing something — this new feature makes Facebook more like Google+. On Google’s new social media service, you can add anyone to a circle, which adds their public updates to your news stream regardless of whether you’re in their circles. Sound familiar? The question here is whether Facebook is a little concerned about the new competition from Google. We may never know, as this could be a feature they’ve worked on since before Google+ launched this summer. Once nice new feature that’s included in the “subscribe” addition is that Facebook is finally allowing us more control over what is shown in our news feed. Do you have a friend who blathers on about her ex-boyfriend too much? What about one who is addicted to FarmVille and thus is flooding your wall with updates on her radishes (or some such thing .. I’ve never played the game). With this new feature, you’ll be able to go to their profile page, click on the subscribe button, and select which type of updates you’d like to receive from that person. Nifty. One thing you WILL have to note with this new feature is indicating who you want to see your own status updates. By default, it’s set to “friends only”, but if there’s something you want the whole world (including non-friend subscribers) to see, you can select “public”. Broadcast to the world! 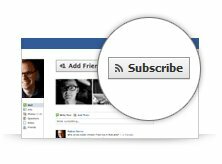 The new “subscribe” button is being rolled out gradually across the Facebook universe. If you don’t see it yet, you will soon. Facebook new features are great and also a good form of advertising to a niche audience.